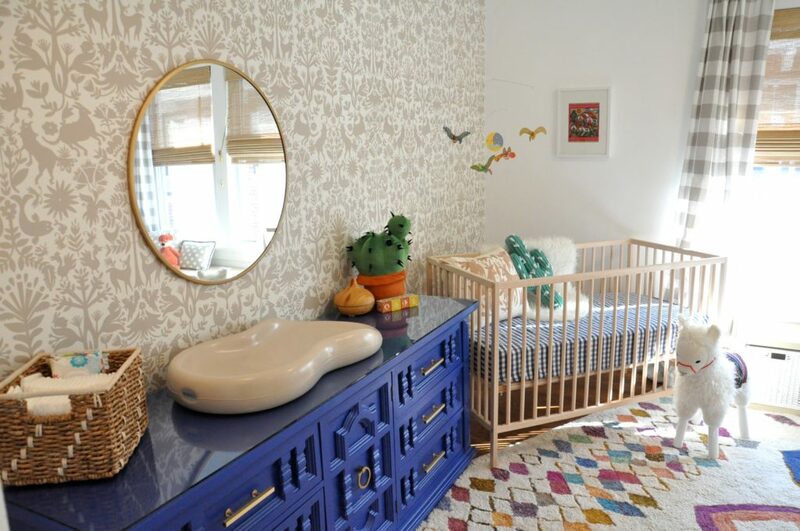 My inspiration for this gender neutral nursery began with the otomi patterned wallpaper. From there I decided to add in some pops of color and whimsy with a few fun llamas as well as the gingham curtains, crib sheet and pouf. I decided to keep most of the furniture quite neutral in form and tone after finding this great dresser and side table pair on Craigslist. With some new hardware and a coat of cobalt lacquer they came to life and added some real personality to the space. Finally, I laid the multicolored rug at an angle and added a few toys, books, and decor pieces to the shelves and hooks. Our baby *BOY! * (Arlo) arrived a few weeks ago and we are so excited to watch him grow and explore his new room.